Our best selling Absco Gable Roof Single Carport incorporates triple web trusses for maximum strength, durability and stability and based on solid steel construction. Concrete slab attachments and all other fixings are standard. Gutters and downpipes are also included. We can supply engineers plans for council approval, please check on their requirements before ordering. This model is engineered to W41C1 Wind Rating as standard and can be upgraded to W50. The standard height is 2.25m that can also be increased to 2.85m. 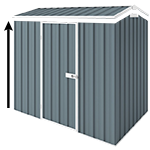 Absco carports come with 30 year written warranty. These carports are manufactured to orders and the manufacturing can take up to 2 weeks. It is DIY and comes flat packed with everything you need including a manual. You will need some tools and we recommend watching some of our videos before building. NOTE: All Absco Colorbond products come with Surfmist Channels / Trims.